How good is the Husqvarna 460 Rancher? The short answer — it’s exceptional; but before we get into all the details let’s talk about Husqvarna, the company. When I hear the name Husqvarna, I immediately think quality. That’s most likely because it’s a brand that has been around for centuries and has become well recognized for producing high quality products. There’s a good reason the name has stuck around for so long and continues to be a highly respected brand when it comes to power tools. Amazing photo of Husqvarna’s humble beginning. Let’s take a brief history lesson to really captivate the versatility and functionality this brand brings in its products. The company is quite popular today for their outdoor equipment, such as the Husqvarna 460 Rancher chainsaw, but did you know it dates as far back as the 1600s as initially a manufacturer of musket pipes? At the end of their rifle contract, the company branched out into other areas during the 1800s ­- 1900s producing various household appliances from sewing machines to gas and electric stoves. Husqvarna has always made great products, including sewing machines. In 1959 they introduced the first chainsaw, along with a motorized lawn mower, and they’ve been leading the industry in innovative products ever since. Husqvarna has come a long way from their first chainsaw, but one thing remains consistent in all of their products. Quality. This company has been a leader with revolutionary ideas that are aimed at improving their products’ performance. They also take careful consideration in the impact that these products have on our environment. They uphold their responsibility in producing products that are not only of value to the consumer, but also valuable to the environment by means of sustainability. ✓ View or download a visual timeline of the History of Husqvarna. Why Invest in a Quality Chainsaw? A beautiful chainsaw. A sign of thing to come in 1959. There are many factors that come into play when deciding on making a purchase and when it comes to power tools, it should be no different. 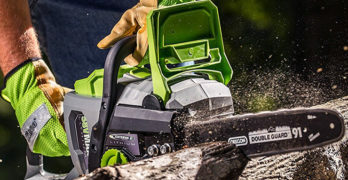 You can find cheaper models in chainsaws compared to bigger known brands such as Husqvarna, and more specifically, the 460 Rancher, which is worth every extra penny you pay over cheaper models! 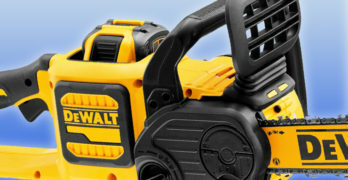 What’s better for your wallet may not always be better for you if that bargain chainsaw is lacking in important features. Some things in life should not be determined by the answer to the question, “Which one is the cheapest?” Chainsaws are dangerous tools which means ergonomics and safety features are absolutely essential. When buying a chainsaw you need to look at it in the same way if you were buying a suit or a dress — it has to fit you properly. You need to be able to comfortably carry and maneuver the chainsaw without hesitation or discomfort. View or download the product sheet on the Superior S10VIB. Safety should be your number one priority when using a chainsaw. High quality modern chainsaws are all equipped with proper safety features. 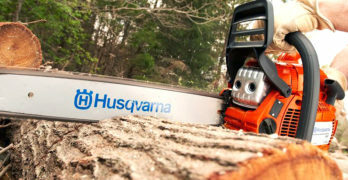 Husqvarna was one of the first to introduce an anti­-vibration function in their chainsaws, which serves as a safety measure for those who work in the forestry industry as it prevents a condition known as hand-arm vibration syndrome (HAVS). I wrote about HAVS extensively in the article on anti-vibration gloves. Protective anti-vibration gloves add another level of safety that I consider to be essential when cutting. They are a smart purchase even if your chainsaw has anti-vibration technology. Never use a chainsaw without wearing full safety equipment. Safety precautions should always be taken when using machinery or operating power tools; however, having the right tools that are designed with your safety in mind can certainly make a world of difference. Even the safest worker can have a slip up that could end in devastating results. A product that is made with care and quality is designed with the consumer in mind. That means when looking to invest in a chainsaw, consider one that is easy to use and easy to handle like the Husqvarna 460 Rancher. Ergonomic designs that make it easier to hold can reduce the chances of injury from an awkward grip or fatigue from working too long without a break. Poorly designed chainsaws that are unbalanced are dangerous to use. Every Husqvarna chainsaw is engineered with customer safety in mind. Also, the components are streamlined and integrated to create a cohesive chainsaw, which is why Husqvarna is able to make powerful chainsaws that are relatively lightweight. You’ll notice that cheap chainsaws from other manufacturers are often heavy. This stems from poor design and from constructing a chainsaw from generic parts. You get what you pay for. Easy to start. 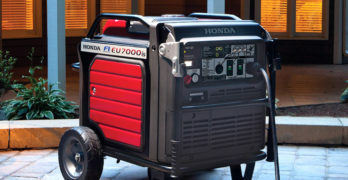 Enough power to handle all of your needs around the home. Aside from these qualities, having a reliable product that is made to last will actually save you more in the long-haul. If you are looking to save money then buying a chainsaw that is well-made could be the better value, even if it means paying a little more for it. After all, what good is a bargain chainsaw if you wind up having to shell out extra money for repairs and parts or, worst-case scenario, you have to buy a new one? Quality is especially important if you’re looking to buy equipment for your own business. If your chainsaw can’t get the job done, it may end up costing you a great deal more than just a new one — you may lose customers and/or time. Poorly made chainsaws are more likely to break down and they will likely cut slower costing you valuable time. The Husqvarna 460 Rancher is made with professional and commercial grade quality so you know it won’t quit on you when you need it the most. Yes, all chainsaws are susceptible to problems. But I can say with confidence that Husqvarna products are pound for pound as reliable as humanly possible. Everything breaks down eventually, but that’s true for anything mechanical. Adheres to the strict quality standards that Husqvarna stands behind. *See details on the 450 and 455 at the end of the article. Application: Heavy Duty, Frequent Use or Occasional Demanding Use. Who’s it for? Semi-Pros, Farmers/Ranchers, Large residential property owners and other demanding users who require high performance. ✓View or download the MANUAL for the Husqvarna 460 Rancher. X-Torq engine: Delivers lower fuel consumption and reduced exhaust emission levels in accordance with the world´s most stringent environmental regulations. Air injection centrifugal air cleaning system that removes larger debris particles before reaching the air filter reducing air filter cleanings and improves the engine life. Side-mounted chain tensioner: easier access to chain tensioning device . Adjustable oiler pump: allows you to control oil flow depending on application and weather conditions. Side-mounted chain tensioner: Forged three-piece crankshaft for maximum durability for the toughest applications. 2-year warranty: Purchase this Husqvarna handheld item along with three 32 ounce cans of Husqvarna pre-mix fuel and your warranty will be extended from 2 years to 4 years. Read more. Excellent for cutting logs for firewood. There is a lot to love with this chainsaw. First off, you know it’s the real deal because it’s made by Husqvarna. If that’s not convincing enough for you then maybe the 60.3cc X­-Torq engine will motivate you with incredible power performance that can deliver on small or large jobs. It’s smart and effective with a fuel-efficient design that produces less emissions than its competitors to meet even the strictest environmental regulations. When you pick up a Husqvarna 460 Rancher, you will have a hard time putting it back down. It is designed for ergonomic handling which makes it more comfortable and natural to hold with a comfortable grip. The side mounted chain tensioner gives you easier access for tensioning. Engineered with high-quality components & great features. The SmartStart feature literally starts smarter with a unique design requiring fewer yanks to get the motor running. 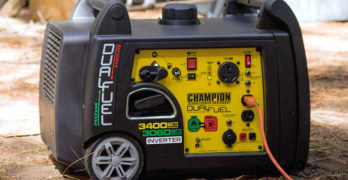 It cuts down on the effort to get it started by up to 40% in comparison to other models. The LowVib feature not only offers safer use during operation, it can also aid in reducing fatigue so you aren’t left feeling completely outdone by your chainsaw. Let’s talk durability. As previously discussed, quality has a lot to do with the durability of a product. The Husqvarna 460 Rancher chainsaw is designed to actually extend the life of the engine using a centrifugal air cleaning system that works to keep the air filter free of large particles and dust. Speaking of air filter, this one features quick release to make cleaning and replacing even easier. If you want your equipment to last, you have to also bear in mind how to maintain it. Fortunately for me, this chainsaw is very low maintenance. The air cleaning system does a lot of the work for me in keeping the engine running at peak performance. Likewise, the combined choke/stop control will help prevent the chance of the engine flooding as a result from numerous yanking attempts to start it. This will save you a great deal on costly engine repairs or replacements. Great for storm clean-up. Ideal for experienced chainsaw users. A three-piece crankshaft lets you get the toughest jobs done. The Husqvarna 460 Rancher can deliver incredible maximum power speed of 9,000 RPM. With convenient features like the SmartStart that makes it easier to operate you can also save time. Apart from the cutting accessories, the unit itself weighs just under 13 ­pounds making it lightweight so you aren’t breaking your back trying to operate this thing. My only concern is that the unit is pretty loud when operating it so I would suggest in buying some ear protection to protect your hearing. looking for a reliable chainsaw for work, you won’t be disappointed by the Husqvarna 460 Rancher. The all-purpose chainsaw can operate and accommodate all weather conditions. In my honest opinion, it is the ideal chainsaw to be used by all people. Learn more about the Husqvarna 460 Rancher on Amazon. 24-inch size is suitable for experienced chainsaw users. This model has enough power to run a 24″ bar and chain but you also have the option to purchase it already equipped with 24″ cutting equipment. Also, if you buy the 20″ 460 Rancher you can have peace of mind upgrading it in the future if your needs change. In terms of overall balance I think the 20″ is ideal for most homeowners, but if you’re an experienced chainsaw user and require more cutting versatility then the 24″ Husqvarna 460 Rancher may be better choice. The official press release went out on March 28, 2013. Who knows how long this will last but I would take advantage of this while you can. Lightweight. Excellent balance. A modern classic chainsaw. View or download the MANUAL for the Husqvarna 450 Rancher. X-Torq engine, anti-vibration, Air injection, Side-mounted chain tensioner, Adjustable oiler pump, Smart Start, Air Purge, Inertia activated chain brake, Combined choke/stop control, Cylinder decompression valve, Snap-lock cylinder cover, 2-year warranty, Air Injection, Side-mounted chain tensioner, Front handle ergonomics, Adjustable oil pump, Felling marks, Quick-release air filter. Good balance between power and price. Read our in-depth review on the Husqvarna 455 Rancher. Maintenance is an important aspect of owning a gas chainsaw. For the Husqvarna 455, 455E and 460 Rancher. Complete kit to maintain your chainsaw. Replacement parts fits 455 Rancher and 460 Rancher. Ideal for those who like to maintain their own equipment. Follow chain saw owner’s manual for regular scheduled maintenance.